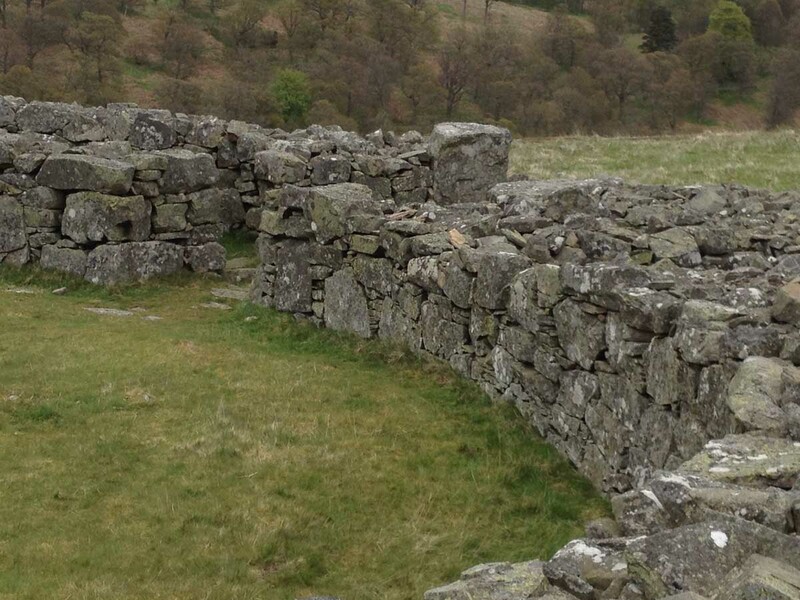 Last week Stephen took me to Edin’s Hall Broch. He had discovered it on one of his longer walks, but I had never been there before – indeed, had never even heard of it. 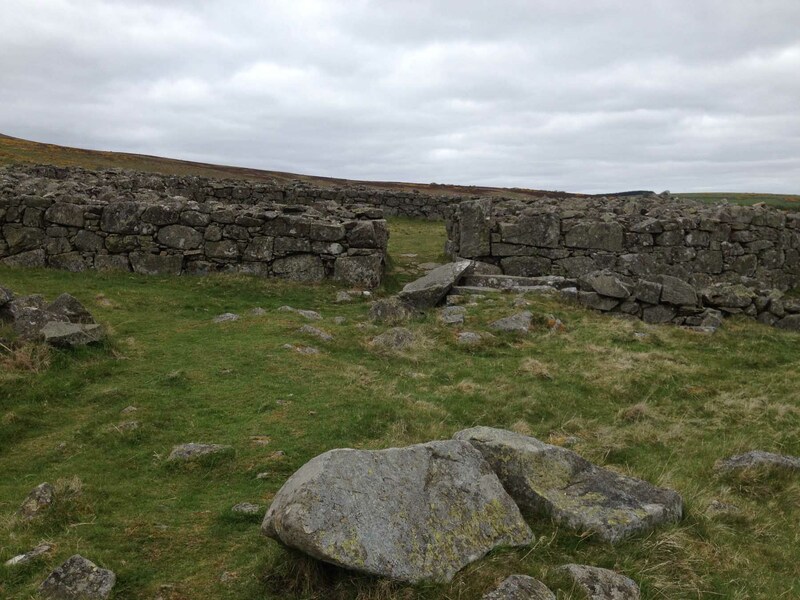 As it turns out, Edin’s Hall Broch is a very remarkable place, and I am surprised more people don’t know about it. Or perhaps they do. Perhaps it’s just another closely guarded Borders/Northumbrian secret. For those of you who (like me) don’t even know what a broch is, here is a brief summary of received internet wisdom. There is much debate about their function and purpose. 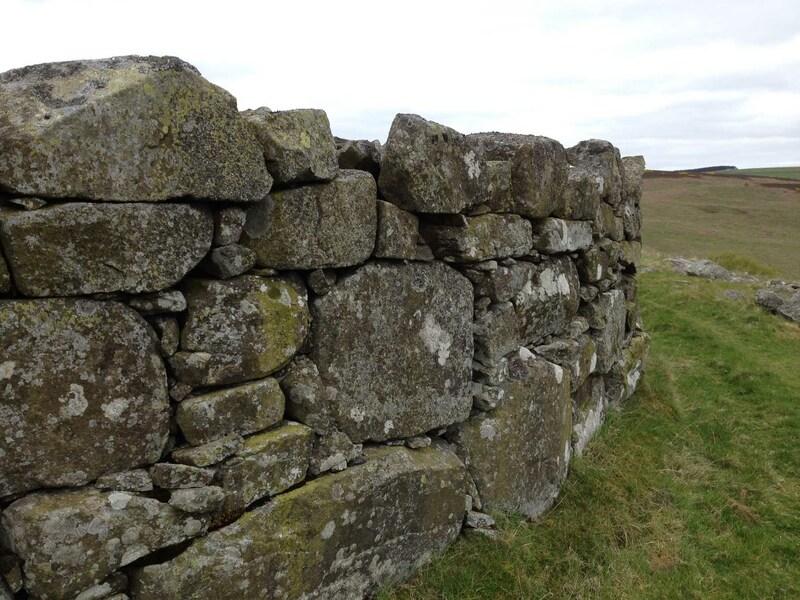 What is agreed is that they are only found in Scotland, they are superb examples of drystone architecture, and they are round. Nobody is sure whether they were built for defensive purposes or to be lived in as farmsteads. 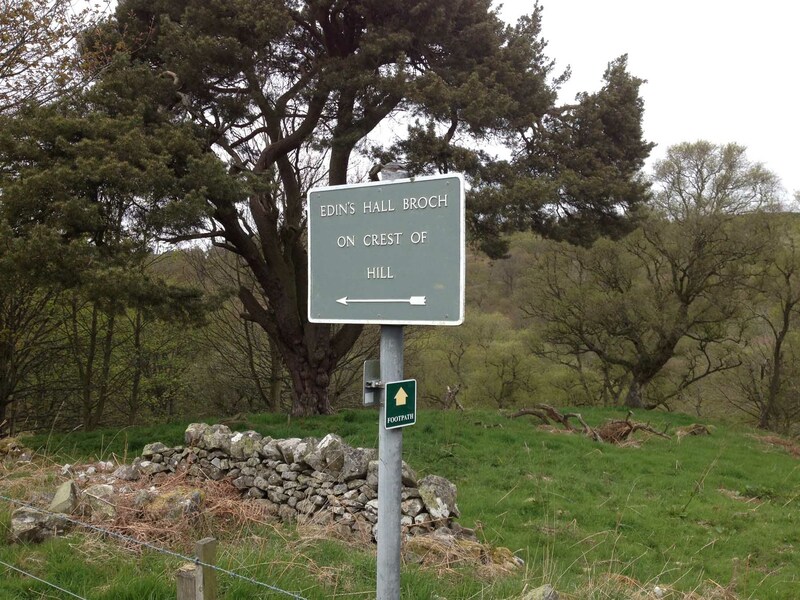 But ooooh – I do love the word “Broch”! I roll it round my lips and savour the sound – quite different from any other word I know. It wasn’t really that special a day to be out. As you can tell from our photos, the day was dull, and it was quite sharply cold for May. But it was still a comfortable – and very interesting – walk from the carpark, about a mile and half from the ruins. 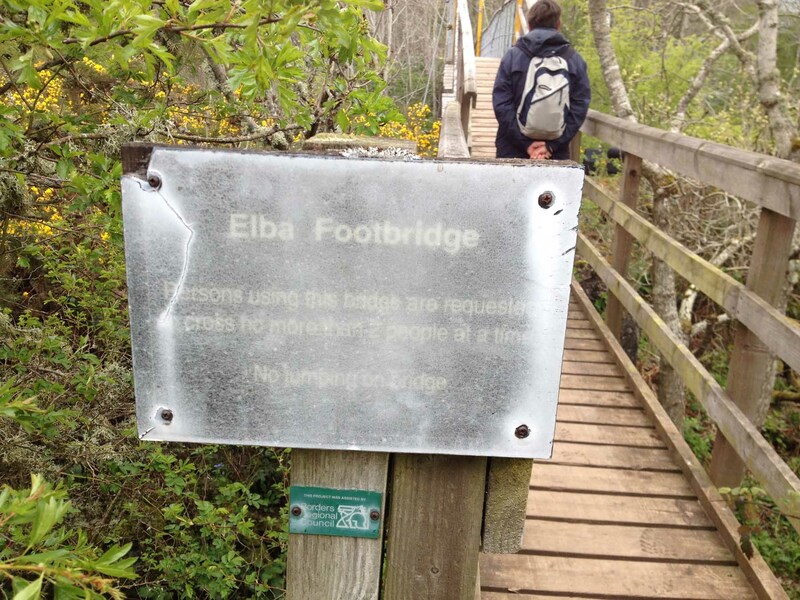 After a short walk through a forested area, you cross the Whiteadder Water by the Elba Footbridge. The Whiteadder Water then runs parallel to the walk as you climb the hill up to the broch. 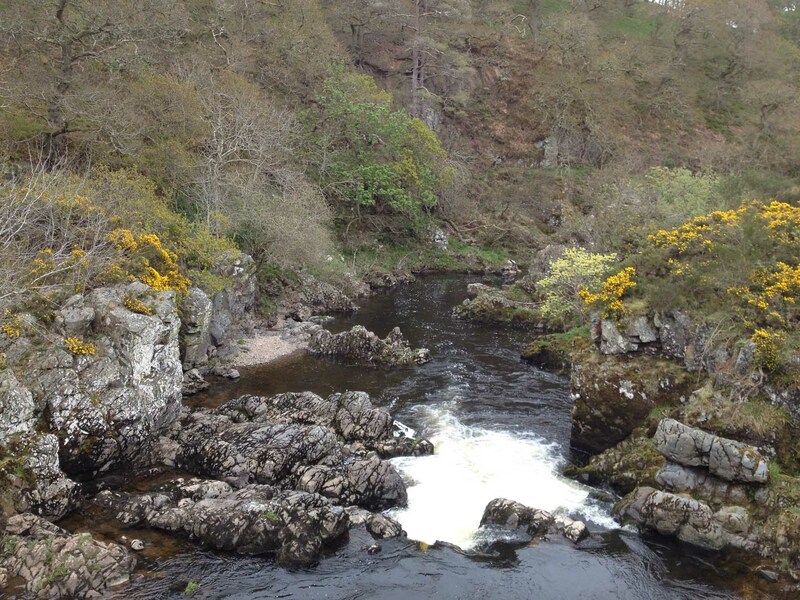 The Whiteadder Water is magnificent here, swirling dramatically over craggy rocks. But, wait – is there a yellow conspiracy afoot?! There’s masses of gorgeous clumps of golden scented gorse, many of the trees are in that early flush of colour when the leaves are transparent yellowy-pale-green, – and to cap it all we saw a Yellow Wagtail bobbing around on the rocks in the stream! Where the scenery wasn’t yellow and green, it was silvery-white. 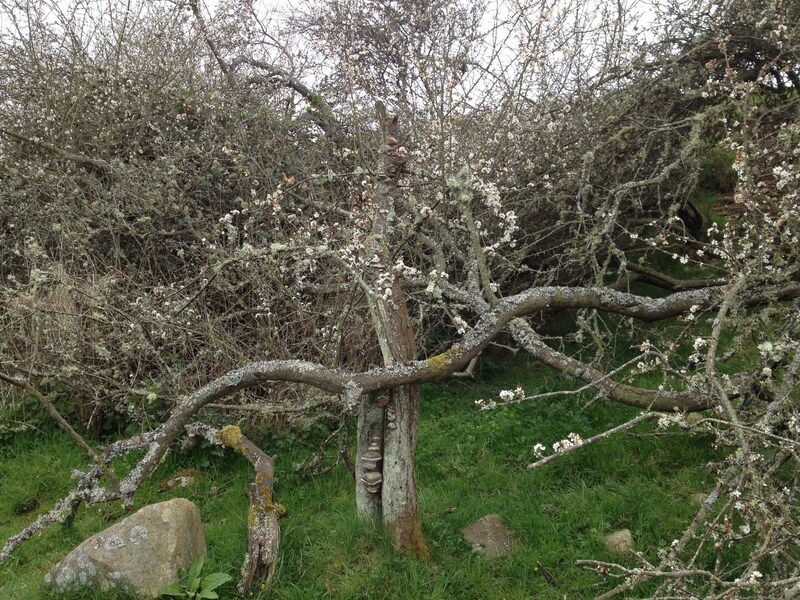 The lichen is as much an ornament on these blackthorn trees as their own blossom. Our route takes us on up and up. The sheep gaze down anxiously at us from the ridge, not sure whether we are friend or foe. 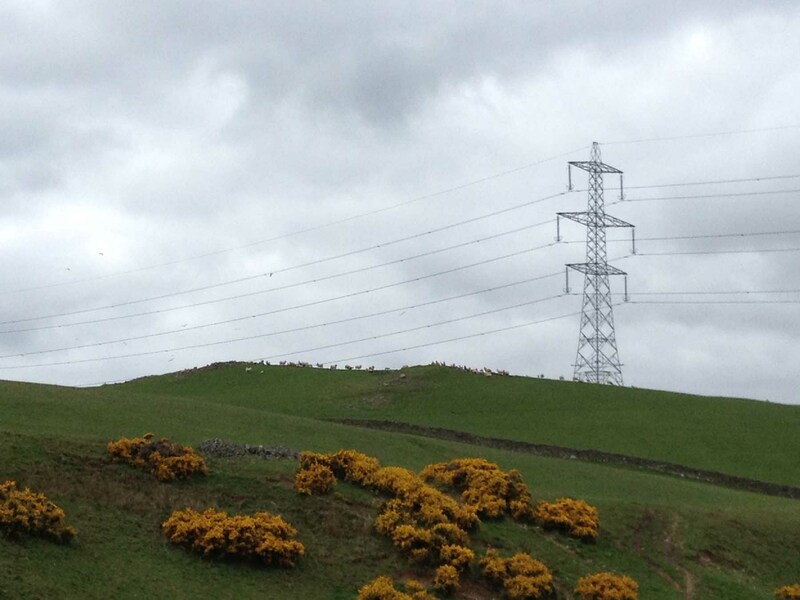 Don’t worry, sheepy friends, we’re travelling up to the right of this pylon. Ah yes, this pylon. We were happily admiring the beauty and wildness of the place when we realised that there was a huge great plonking pylon – no, a chain of pylons striding across the valley. How fascinating that we’d subconsciously “subtracted” it from our awareness. How strange too that we object to wind farms but seem oblivious to these earlier man-made monstrosities. The way is well-signposted. But look behind the sign, and there’s a telling indication of modern farming. 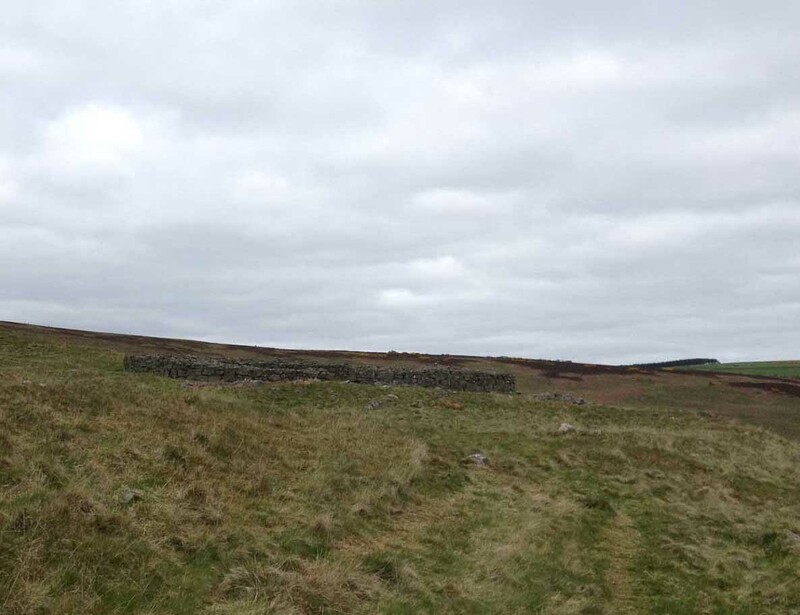 That’s the old drystone wall broken and crumbling, and it’s been superceded by an ugly barbed-wire fence (which you can just see in the foreground of the photo). How very sad. Nature gives and it takes. En route we found evidence of the harsh reality of nature red in tooth and claw. 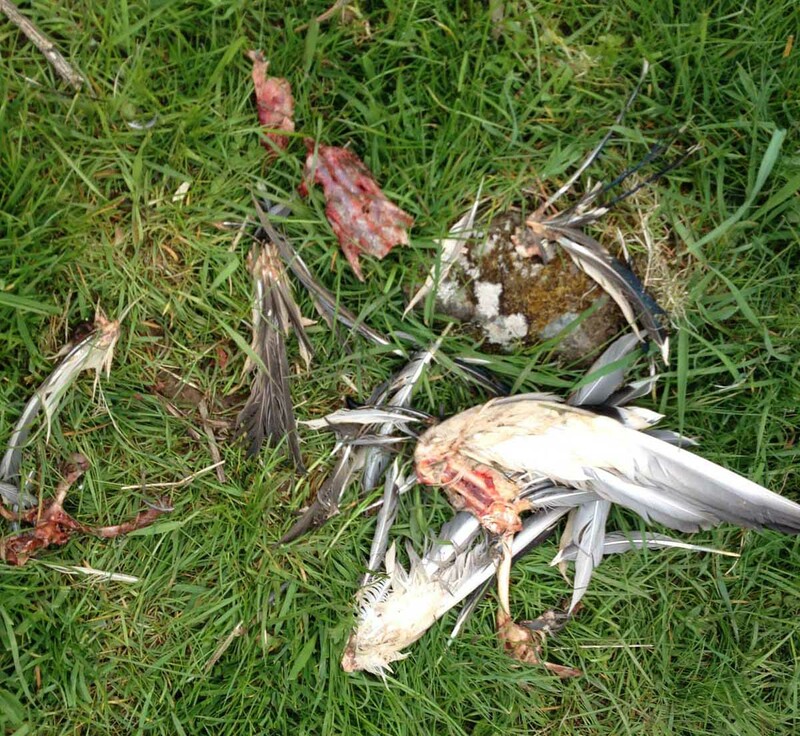 Somebody’s dined here….perhaps the sparrowhawk we saw wheeling above? 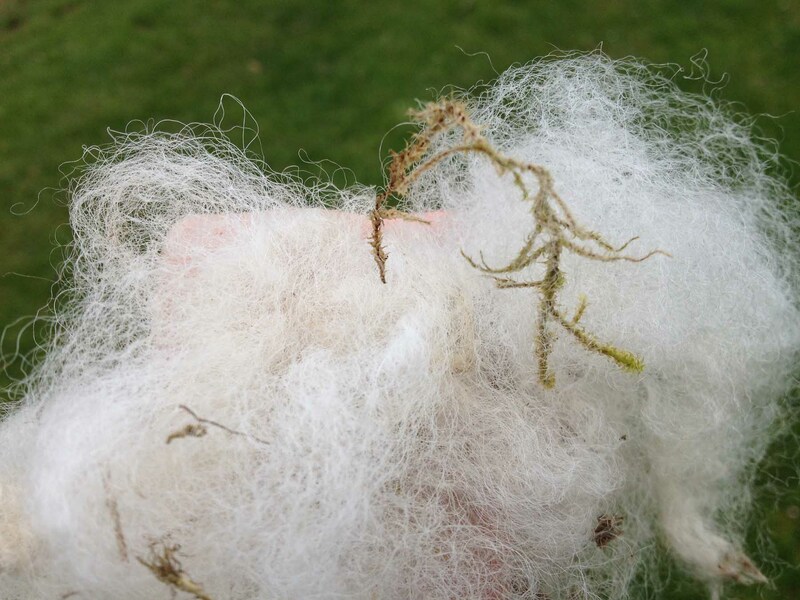 However the kindly sheep have left me some lovely bits of fleece to collect – it’s the softest and cleanest fleece I have found out and about for a long time. Wish I could catch a sheep to take some more fleece home with me! Finally, we get to the top of the hill, and there – amid a lot of other stone ruins (it’s a prehistoric hill fort) – is Edin’s Hall Broch! (You get a really good idea of the whole site with this aerial picture on the Welcome to Scotland website.) 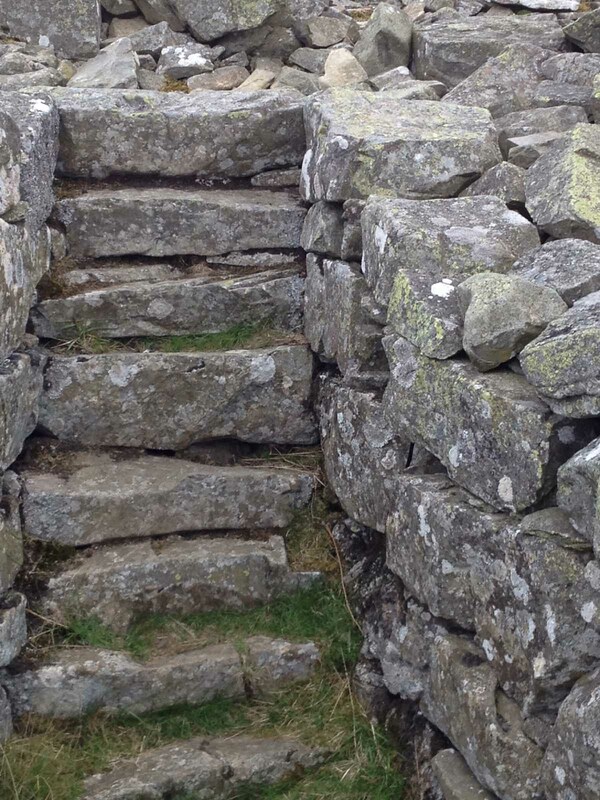 The people who built this place knew about dry stone walls – they could teach modern farmers a thing or two. Just look at the size of the stones at the base of this building! The size of the walls too is enormous – at their maximum they are over 5 metres wide. There’s a proper entrance, and what must be a front door slab lying on the ground beside. On either side of the front entrance, there are guard rooms. Set in these huge walls around are well-built steps and more rooms. Perhaps the most intriguing thing about this place is that this is one of only a handful of brochs in the Lowlands. They are mostly found in northern western Scotland. And this broch is not like the northern brochs – it’s too large in diameter for starters, so there are doubts that it was ever roofed. 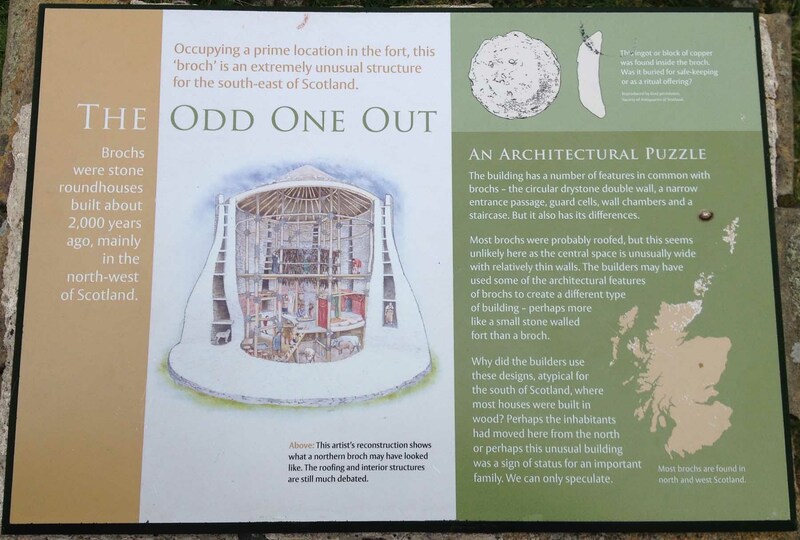 As you will see on the information board reproduced below, Historic Scotland have come up with the hypothesis that somebody in the 2nd century AD travelled south bringing broch-building skills with them and adapted them to this Border locality. Who knows? What we do know, however, is that when this site was first excavated in the late 19th century, a number of artifacts were found (these were donated to the Museum of Scotland). They include a stone spindle whorl, a piece of jet ring, an amber bead, an oyster shell, bones and a fragment of a glass bracelet. Very much the normal sort of possessions of people’s lives – food, ornamentation, and the means to clothe oneself. I’d read about spindle whorls recently in Rebecca’s Needle and Spindle blog. She describes so clearly what an vital part they had to play in basic survival tactics – and that would have been especially the case in these colder northern climes. So – I’m once again stretching my imagination back to the people who lived here, and I’m finding that they (like me) enjoyed a bit of bling. Ancestors of the modern sheep grazing around would have been of value to them for clothing – just as they are to me. The modern world interrupts my old-times reverie. Well – a slightly more modern world. Down through the trees, on the other side of the Whiteadder Water, there’s a glimpse of an intriguing house – actually another Round House. 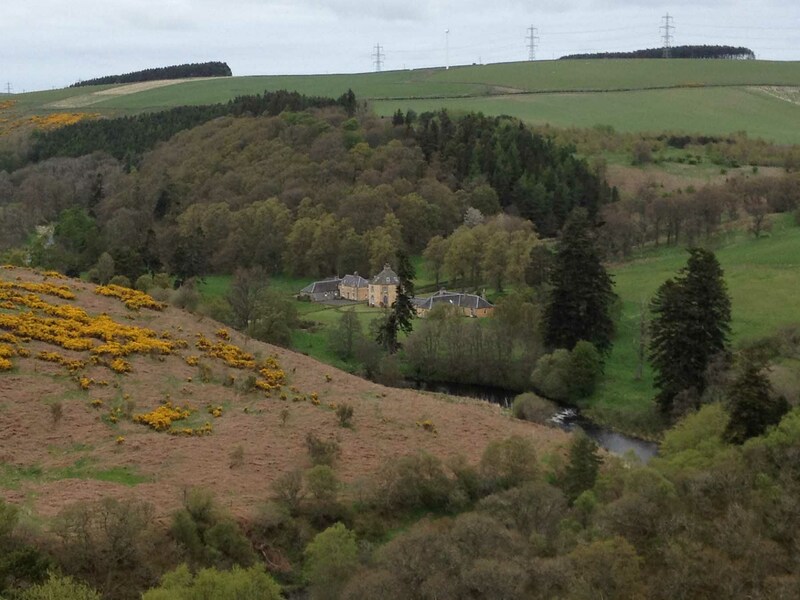 Apparently it’s The Retreat, built in the late 18th century by the Earl of Wemyss as a shooting lodge. 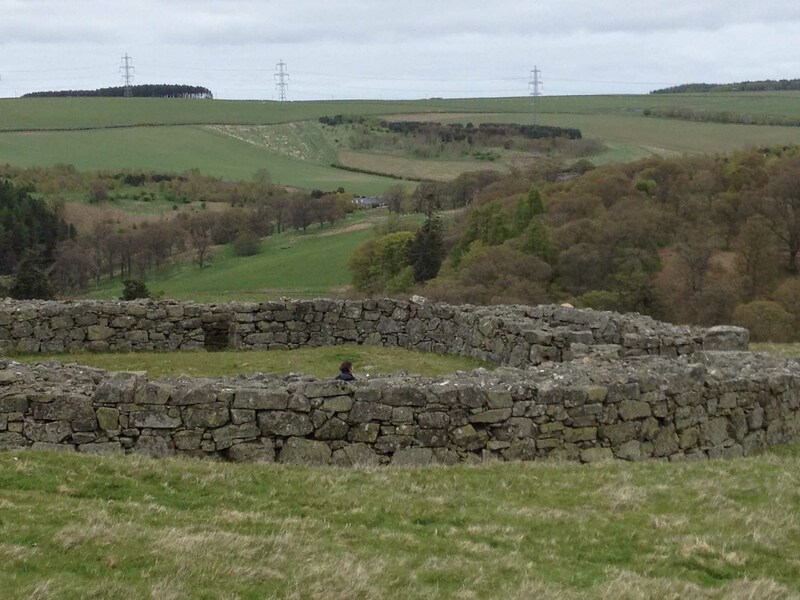 You can’t help wondering if he was referencing the round broch on the opposite hill in his choice of architecture…… It looks very comfortable and well-appointed compared to the exposed stony broch of the ancients.